Product prices and availability are accurate as of 2019-03-30 19:40:01 EDT and are subject to change. Any price and availability information displayed on http://www.amazon.com/ at the time of purchase will apply to the purchase of this product. 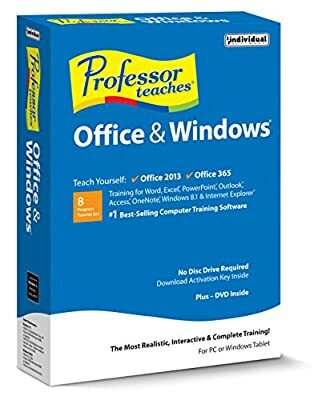 Professor Teaches, the leading brand of training, provides realistic and interactive training for Microsoft Windows 8.1, Office 2013 & Office 365. Learn the features of Office 2013 & Office 365, and the new Windows 8.1 operating system. Build your skills quickly with interactive tutorials and practical exercises. Exploring the Start Screen Introduction to Charms and Apps Using the Touch Keyboard Arranging Your Favorite Live Tiles Adding RSS Feeds, and more!